A fresh coat of paint is often touted as being a simple way of giving a building a new lease on life. Paint acts as a shield against corrosive substances, excessive moisture, and is also commonly used for its aesthetic potential. The same goes for traditional render, made with a combination of sand, lime, water and typically cement, which is designed to make the mixture more durable. Rendering can improve the waterproofing and fireproofing of a building. However, both have their distinct downsides. A fresh coat of paint may be touted as a simple way to give a building a new lease on life because of the inadequacies of the previous coat; inadequate surface preparation, incorrect paint choice or misapplication can result in cracking and flaking, mildew growth, chalking, surfactant leaching, yellowing, blistering, wrinkling… the list goes on. Cement rendering is not without its problems either, susceptible to both cracking and spotting, the latter of which is also known as efflorescence, when natural salts found within the rendering mixture reacts with water. Like paint, cement rendering may require regular maintenance, the frequency of such depending on whether it is located internally or externally, and how much moisture the wall is exposed to. Acrylic render has been gaining in popularity in recent years, with increased awareness of its benefits over traditional wall coatings. Acrylic render differs from the standard cement render mixture with the addition of acrylic into the mix, making it stronger and more flexible. 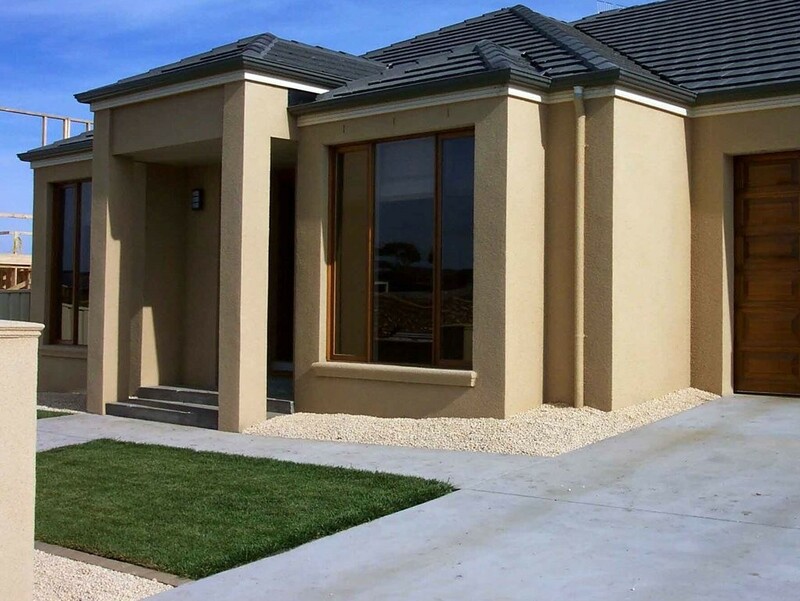 Furthermore, it also has been shown to adhere to a wider variety of surfaces than traditional cement render and without any surface priming as is required with paint, such as concrete, timber and fibre cement. Stonecoat is an Australian owned and operated brand specialising in pure acrylic bound textured wall coatings. As an acrylic bound wall coating, Stonecoat is impervious to mould and fungi and will not produce hairline cracks that paint and traditional cement render are each prone to do. Furthermore, unlike traditional pigmented textured finishes, Stonecoat’s wall coatings will not fade or discolour over time, due to it being composed of naturally coloured stone [marble or granite depending on the colour] graded between 0.50-1.25mm. Stonecoat can be used on a wide variety or surfaces such as; tiles; concrete panels; Blue board; foam panels; cement sheets; rendered surfaces; timber; brickwork; Hebel; plaster board; glass; Dincell panels; galvanized iron; plastic; and more. Its composition means that an application of Stonecoat requires no need for primers, sealers, bonding liquids or colouring agents, and once applied requires little to no maintenance. If and when necessary, the Stonecoated surface may be cleaned using only a high-pressure water hose. Stonecoat is typically applied with a spray gun, although in special circumstances is applied with a trowel. It requires a two-coat spraying, with the nominal thickness of the two coats being about 3mm. Stonecoat eliminates joint lines in the process. It is suitable for any commercial or residential application. For more information about Stonecoat, visit their website here. "Common Painting Problems & Solutions". 2017. Omega Paints. Accessed May 26. http://omegapaints.com.au/coating-tips/paint-problems-solutions/. Edwards, Mike. 2017. "What Is Efflorescence | Tips For Treating Salting On Plaster And Preventing Efflorescence From Reoccurring". DIY Doctor. Accessed May 26. http://www.diydoctor.org.uk/projects/efflorescence-causes-and-cures.htm. "Render". 2017. BUILD. Accessed May 26. http://www.build.com.au/render. Fitzgerald, Jaclyn. 2013. "What Is Acrylic Rendering?". Home Improvement Pages. https://www.homeimprovementpages.com.au/article/what_is_acrylic_rendering.